A Dictionary of the English Language was first published on 15 April 1755. 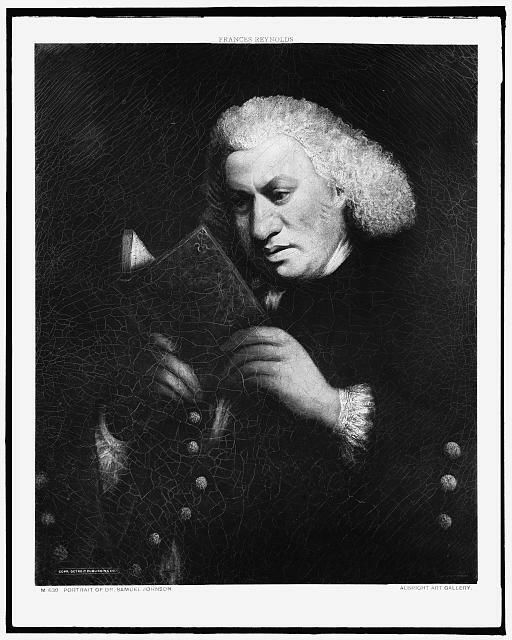 The moment in June 1746 when Samuel Johnson signed the contract with a group of booksellers for A Dictionary of the English Language was a turning point in his life. At 46 he was a penniless, almost unknown, hack writer in imminent danger of the debtors’ prison, but now the substantial fee of 1,500 guineas (probably well upwards of £150,000 today) enabled him to rent a comfortable house for himself and his wife in Gough Square, off Fleet Street near the Cheshire Cheese, and hire a staff of assistants. Johnson’s wife Tetty died in 1752, which was a devastating blow. He managed to blame himself, for no reason that seems to make sense, and never remarried. He stayed on in Gough Square with a succession of cats and a collection of oddities, lodgers and servants, who included his young black manservant and protegé Frank Barber, a widowed Mrs Desmoulins from Lichfield, a spinster poet named Anna Williams who had gone blind when a cataract operation failed and the copyists and secretaries, up to six at a time, who worked standing up at a long desk in the garret. The production line ground on and although the work took more than twice as long as the expected three years, the dictionary was duly published in 1755 in two volumes with approaching 43,000 entries in 2,300 pages. It was not the first English dictionary by any means, nor the one with the most words. There were various mistakes and Johnson, asked how he had come to define ‘pastern’ as a horse’s knee, honestly replied ‘Ignorance, Madam, pure ignorance’. What made it work were the clarity of Johnson’s definitions, his concentration on ordinary, everyday words and his principle that a word means what it is used to mean by the best writers in the language. It has been estimated that Johnson defined some 80 per cent of the English vocabulary of his time. A few of his definitions were pungently opinionated. ‘Patron: one who countenances, supports or protects. Commonly a wretch who supports with insolence, and is paid with flattery.’ ‘Oats: a grain, which in England is generally given to horses but in Scotland supports the people.’ Whig is dismissed as ‘the name of a faction’, by contrast with an approving definition of Tory. A lexicographer is ‘a harmless drudge’. Ruse he described as ‘a French word neither elegant nor necessary’. He disliked ‘spick and span’, which he said he would not have expected to find in any polite writer, but it was in Swift and so it went in. Johnson refused to quote from Thomas Hobbes, however, because he disapproved of his ideas. The treasure hoard of more than 100,000 quotations with which Johnson’s definitions were illustrated came mainly from the leading English authors of the previous two centuries, but from science and medicine, law, philosophy, theology and sermons as well as literature from Shakespeare to Milton, Dryden and Pope. The effect was to create a blend of dictionary, encyclopaedia and companion to English literature. An author’s inclusion was intended as a spur to explore his work. This was nonsense and the book made his name. He was known ever afterwards as ‘Dictionary’ Johnson and his was the English dictionary for writers from Wordsworth and Jane Austen to George Eliot, Browning and Carlyle. Macaulay called it ‘the first dictionary that could be read with pleasure’ and it remained the dictionary of English until the great Oxford English Dictionary was completed in 1928.